I’ve just returned from my first trip to New Orleans. I was in New Orleans for the annual conference for the Association of Small Business Development Centers. My husband accompanied me. Due to attending conference sessions, I didn’t have an abundance of time for sight-seeing, but we made the most of the time we did have. I’m sure that everyone who visits New Orleans comes back with different favorite restaurants, night clubs, and tourist attractions. These are my top ten, not in order of favorites, as ranking them would be too hard, but rather they are in the order in which I experienced them. 1. Parasols Restaurant. We stumbled on this hidden gem quite accidentally. After settling in our hotel room, Steve, my two co-workers, and I set out to see a bit of the garden district. We caught a trolley and then a bus to reach the district. We strolled around for about 40 minutes admiring the large, well-maintained houses before deciding we needed nourishment. We headed for the first restaurant we saw. Unfortunately, it was closed. A local man advised us that we should go “one block down and two blocks to the right” and we would find a great restaurant. It doesn’t look like much, but they serve up delicious food in ample quantities. I had my first New Orleans gumbo and gravy cheese fries at Parasols. 2. 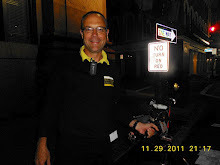 Pedicabs–After dinner we returned to our hotel and decided to stroll over to RiverWalk. It was closed, but we encountered our first pedicab driver. Steve and I hitched a ride to Jackson Square. Pedicabs aren’t the cheapest way to travel in New Orleans, but they are the greenest and a great way to enjoy the city. We utilized the pedicabs several times over the next three days. Each pedicab driver was polite, friendly, and truly loved his/her job. 3) Mule-Drawn Carriages–We have occasionally taken tours on horse-drawn carriages, but this was our first experience with carriages pulled by mules. Our tour guide explained that the climate is too hot and humid for horses; mules, however, cope quite well. We thoroughly enjoyed our 30 minute tour and learned some interesting facts about New Orleans. 4) Irvin Mayfield’s Jazz PlayHouse–We spent two evenings enjoying the wonderful musicians showcased at Mayfield’s. The first evening we listened to Jason Marsalis (brother of Wynton and Ellis). Jason is an amazing drummer; his pianist and bassist were excellent. The pianist had actually composed a few of their numbers. The next night Mayfield’s own band NOJO Jam Session played, minus Irvin Mayfield, unfortunately. They were also amazing. We skipped Mayfield’s on our final night, but my co-workers went and said James Rivers was their favorite performer. They stayed through all three sets and thoroughly enjoyed their evening. The food at Mayfield’s was also quite good. 5) Oceana Grill–Located just off Bourbon Street and across from the Royal Sonesta Hotel, Oceana Grill offers great food at very reasonable prices. We shared appetizers of oysters Rockefeller and barbeque shrimp. Steve had a fried seafood platter, while I ate redfish with crawfish mushroom cream sauce. I loved every bite. Their desserts were very tempting, but we were beyond full. 6) Royal House Restaurant–On our last night, we asked our pedicab driver to recommend a restaurant and he took us to Royal House. Although everything we ate in New Orleans was delicious, the dinner at Royal House was definitely our ultimate dining experience. We started with oysters royale and sautéed crab claws. The crab claws were our favorite dish of all that we tried in New Orleans. I wished I had asked for a spoon so that I could have enjoyed every bite of the wonderful sauce. For dinner, I had the crawfish and crabmeat ravioli (recommended by our pedicab driver) and Steve had shrimp creole. Again, both dishes were fantastic. We really didn’t have room for dessert, however, the bananas foster cheesecake was calling to us. It was truly delicious, but I was too stuffed to properly enjoy it. 7) Frenchmen Street–Much quieter than Bourbon Street, Frenchmen Street has plenty of nightlife to offer. We strolled the street, listening to the music emanating from the many bars and restaurants. Most venues did not have a cover charge but do ask that you purchase drinks and tip the band. For the price of two drinks, we sat for quite a while in The Maison and were treated to the vocals of a very talented singer with a wide range accompanied by three musicians. Unfortunately I don’t remember the name of the group. We were happy to leave a generous tip for the band on our way out. 8) Street performers and artists–From Jackson Square to Bourbon Street to Frenchmen Street, we were constantly treated to street performance and performance art. On Bourbon Street, we enjoyed a troupe of street dancers. Jackson Square was filled with artists displaying their paintings, musicians performing jazz and blues, and performance artists pretending to be statues. On Frenchmen Street, we happened upon a community of artisans displaying their crafts late in the evening. One craftsman made art and jewelry from forks, knives, and spoons. Others displayed sewn or knitted items or paintings. If I had brought an extra suitcase, I would have been tempted to get a lot of my Christmas shopping done early. I did buy a few small items that I knew would fit in my crowded luggage. 9) Jackson Square–We spent a lot of time at Jackson Square. The mule-driven carriage begin their routes there and artists and musicians abound. There is also any number of great restaurants and shops. We ate at the Rivers Edge and Cafe Dumond. Both were very enjoyable. We enjoyed the shops and made a few small purchases. Additionally, there is easy access to walk along the river at Jackson Square. 10) The French Market–It is a combination flea market and farmer’s market. We enjoyed seeing the various products for sale in the market. From produce to sun glasses to art, there was a little bit of everything. I particularly enjoyed a photographer’s beautiful scenes of the French Quarter and purchased a photography of the Court of Two Sisters restaurant on Bourbon Street. As you can tell, we thoroughly enjoyed our visit to New Orleans. These are my top ten favorite places and things in the city. If you’ve been to New Orleans, what did you most enjoy? I am glad you had a good time, although most of it was business. I’m sorry you didn’t enjoy New Orleans, Lenore. My brother and sister-in-law stopped there on their honeymoon cruise and didn’t like it either. Steve and I loved it. We pretty much avoided Bourbon Street, except to go to the Jazz PlayHouse and Oceana Grill. We talked to the locals and were directed to the places they eat and go to for entertainment. Plus, we were back at the hotel by 11 each night, as I had 8 o’clock classes.